Tapioca flour, also known as tapioca starch, is ground to a powdery fine granulation from the dried roots of the cassava plant. It is a starchy, fluffy and slightly sweet flour. 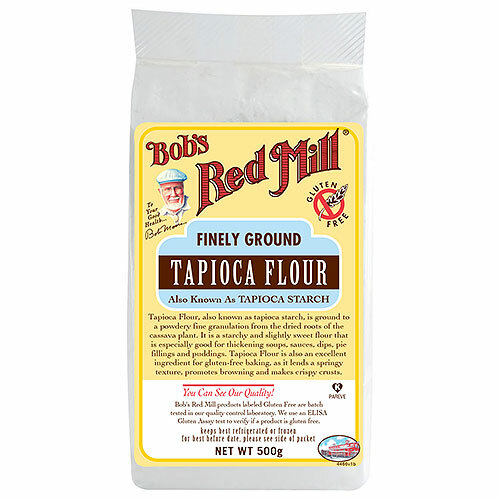 Tapioca flour helps bind gluten free recipes and improves the texture of baked goods. Tapioca helps add crispness to crusts and chew to baked goods. It is especially good for thickening soups, sauces, dips, pie fillings and puddings. 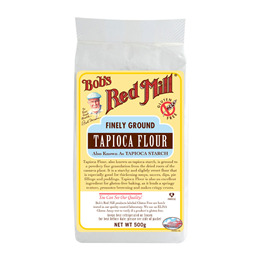 Below are reviews of Bob`s Red Mill Tapioca Flour - 500g by bodykind customers. If you have tried this product we'd love to hear what you think so please leave a review. Tapioca flour, also known as tapioca starch, is ground to a powdery fine granulation from the dried roots of the cassava plant. It is a starchy, fluffy and slightly sweet flour.